“Give a hit, take a hit. Get in the game.” I remember an old hockey coach saying. I chipped the puck off the boards and into the zone, then braced for impact. I lean in for the contact with a small jump. Survived. And the game, Slugs vs Moose, gains momentum. I play on a hockey team, the Stowe Slugs. We are the premiere old-man team in Vermont. There’s a league for non-contact hockey that guys out of college like to play, called the Catamount League. The pace is quick, but there’s no hitting allowed. We all know that we need to get up and work on Monday. The Slugs have won the Catamount League championship three years running. Now, however, we were out in Jackson, Wy., playing contact hockey against their home-town team, the Jackson Hole Moose. Jackson gets rowdy for hockey. They have games Friday and Saturday nights at 7 pm. In addition to hockey, there’s live music between periods, co-ed youths playing before they do the ice, local beer for sale, pizza, kids running around in fashionable red Moose Hockey sweatshirts with skate laces for neck draws. Typical attendance is 1,100 fans, an incredible turnout for a town of 10,000. It’s an all-around good time. We were invited because I lived in Jackson for two winters and had the privilege of playing on the team. They are in their own league, the Black Diamond Hockey League, but they invite out-of-conference competition, like us—the Stowe Slugs—to come play. 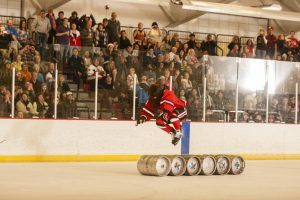 They provide lodging, transportation from the airport, a gear stash room at the rink, a pregame skate Friday morning, and discounted lift tickets to the Snow King ski hill in town. Again, it’s an all-around good time. But, they play contact hockey. For some of the guys on the Slugs, this is the first game of contact hockey they’ve played in two decades. We are in it now, though. The first play of the game, my center won the draw clean, and I, the right winger, backed out into space and moved up ice. The pass put me into the danger zone with their D-man, who stepped up to play the man. I chipped the puck past him and took the hit. My mind was in it. After 5 minutes the Moose are up 2-0. The Slugs are working into the game, trying to catch their breath at 6,200-feet elevation, and playing their first full-length game. We warmed into the game slowly, 3-0, 7 minutes in. Dang. Everyone got their second shift and settled in. Finally, 3-1 with 2 minutes left in the first. A well-executed breakout, a decent entrance to their zone, and a sloppy goal gave us hope. The hockey games were back and forth. Lots of Vermonters on the ice. Much of their team is from the East Coast and many from Vermont. It’s good competition, with some former college players and a few ex-pro’s, but everyone goes to work on Monday. Jackson is so far away from real quality hockey, or professional sport of any kind, that the Moose are revered. Their youth program is a part of the Moose organization, so many of the players are coaches. 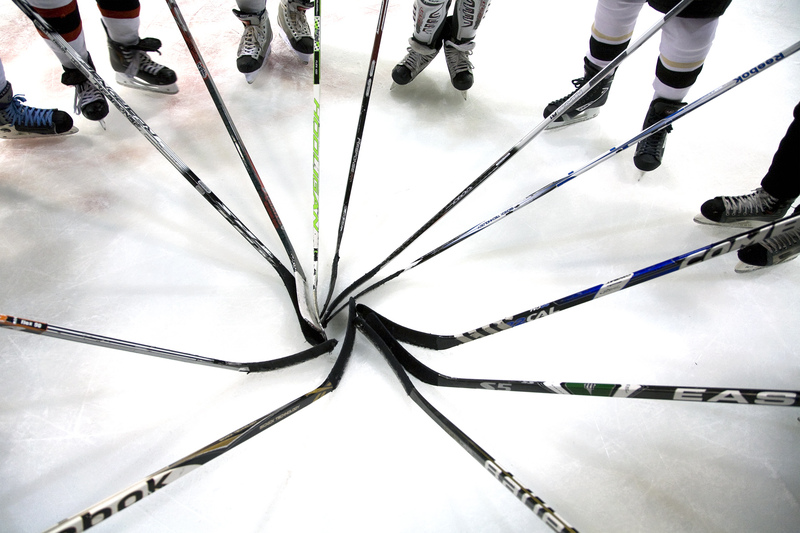 This helps create the aura of good hockey. We put on a show for the fans and enjoyed the rest of the trip. There was one fight, stitches in the locker room post-game, hits, net-front skirmishes, goals, and celebrations. 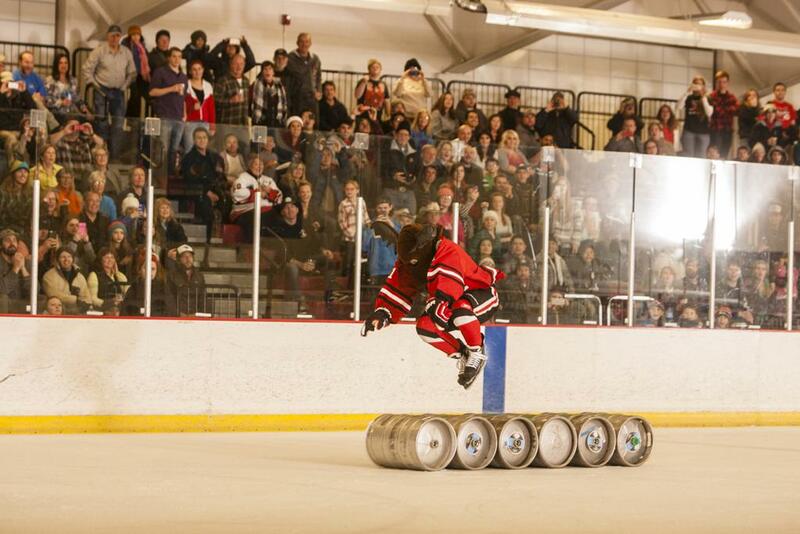 Everything you could want in a hockey game. During the days the team rented snowmobiles to go nine miles up a roadless back canyon to a hot spring, others went skiing at the world renown Jackson Hole Mountain Resort, some relaxed and went into the national elk refuge to see the elk, mountain goats, bighorn sheep, and bison. Did I say yet that it’s an all-around good time? When it was all said and done, we lost both games by one. But really, we let them win. Because—as the ref said in explanation of a bad call—“no one is here to watch the Slugs win.” That said, our trip was a success. The Slugs go to Jackson Hole for another round of Slugs vs Moose, February 1-2, 2019. Come join Slugs team sponsor Sisler Builders and other Stowe fans for some great hockey. Don’t forget your skis!